In an uncertain market--and you can never be sure whether or not the market is uncertain--people can still trust the value of New Order stock. It's worth one million isk per share, now and forever. It's no wonder, then, that more and more people are choosing to invest in New Order shares. Why take a gamble with in-game isk? The Conference Elite continues to be a responsible corporate citizen. With 315 additional shares, courtesy of Samantha Ivainesu, TCE caused us to pass the 463 billion isk mark. TCE earned a Supreme Protector's Tip of the Hat™ by proxy. Again. Lynne Ekanon is the latest to join our ranks. 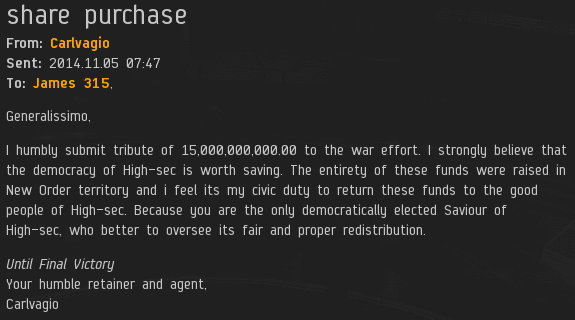 Lynne bought 1,000 shares, sending us over the 464 billion isk mark and earning a Supreme Protector's Tip of the Hat™. Democracy is super important. The New Order is EVE's most perfect democracy, as its leader (yours truly) took power in a free, fair election. Carlvagio understands all this, and it led him to the conclusion that it was time to buy more shares. His purchase of 15,000 additional shares sent us over the 465, 466, 467, 468, 469, 470, 471, 472, 473, 474, 475, 476, 477, 478, and 479 billion isk marks. Impressive! Carlvagio earned New Eden's first Fifteen...uple? Supreme Protector's Tip of the Hat™. Carlvagio is one of our top shareholders. Yet each and every isk counts (as long as it's over a million isk). Take Jessica Dune, for instance. She owns 60 shares, worth a total of 60 million isk. Her story, her path to shareholdership, is just as important as any other. It started off innocently enough, with her ship being tackled in a wormhole and held for ransom by one of our Agents. 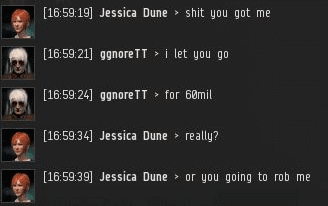 Our hero, ggnoreTT offered to let Jessica go for 60 million isk. She paid, so he let her go. Toggling off a warp disruptor isn't the only way to let someone go; you can also release the warp disruption by destroying their ship. This was the option ggnoreTT chose. Happily, Jessica was fully reimbursed. You don't need to be cutthroat and competitive to succeed in business. Sometimes a solution can be found that works to everyone's advantage. The New Order is good at business and spreading happiness. We're up to 479 billion. We could cross the half-trillion mark any day now! Carlvagio just wasted a heck of a lot of ISK. I hope you know that this will eventually get you banned, Carlvagio. I'm more and more certain that I had a role in the permaban wave that handicapped your so-called "alliance" with each passing day. 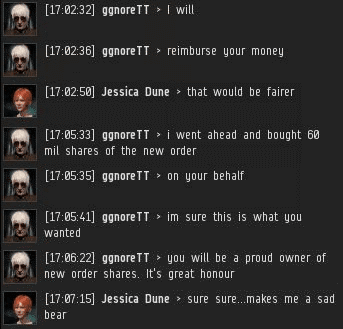 Veers as you are a platinum membership, card holding carebear, who's only goal in EvE is to simply accumulate isk. It's redundant for you to claim that spending isk is a waste. We all know you don't get it. Veers the more you spout your toxic rhetoric on here, it only makes rl players want to put isk in to the NO coffers. So that content players can show the rest of the EVE community what having funs about. The games lost great content input, when the permabans happened to the likes of DJ. Blue google account "Veers" is D400, not me. Did you not pick up on that by now? Veers Belvar your so full of s@@@. Be a man and learn to play the sandox, or quit eve. Maybe you should learn what the sandbox actually means. Then quit eve. I learned a long time ago, in a galaxy far far away. Shame veers didn't. Nope, you clearly have not. Get back there, study some more. Don't return until you've really learned it. 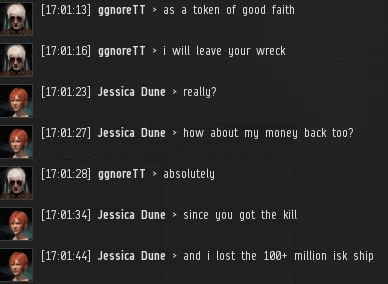 Veers E1, doesn't know how to make a good investment like all the decent players of EVE have. Never mind him topping your gift to content gaming of EVE. I was gifted 1 share, but due to the serious appearance of a conflict of interest I was forced to ask James 315 to transfer it to another party. As I am the leading opponent of CODE, I will not be purchasing any shares. I would also point out that failing to honor ransoms is a despicable act, one worthy of rebuke and denigration, and is unfortunately all too common among the third rate hacks who call themselves agents these days. I'm sure James 315 does not approve.